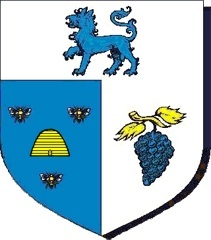 Per pale azure and argent, to dexter a beehive between three honeybees volant proper, and to sinister a bunch of grapes azure, slipped and leaved Or, on a chief argent, a tyger passant azure. 1) Competitions- held at most camping events. Brewers from all walks of life enter their potables and through a criteria of judging, the scores are tallied and the winner of each category is announced at the end of the event. Each year the East Kingdom Brewer's Guilde holds their Collegium. 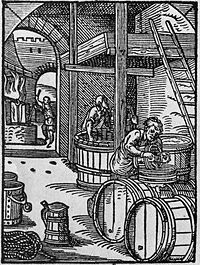 This is a Brewer specific event where classes are held along with Panelling opportunities and research into period beverages. In recent history the Collegium rotates from North-South every year. Being a college in good standing with the Crown of the East, and to facilitate the collection of taxes, dues, bribes, tribute, or other such payments as are required of the Guild, the Guild maintains a complete and thorough ledger of all works produced and distributed by its Members throughout this Kingdom and any Kingdom to where our wares may travel. Those who wish to view our records are welcome to do so.